Big life transitions happen to us all, some seemingly against what we think we want and others exactly as we’ve planned. Having a baby, starting or ending a relationship, facing the empty nest, career change, health crises—there’s no end to the variety of transitions that life can serve up. 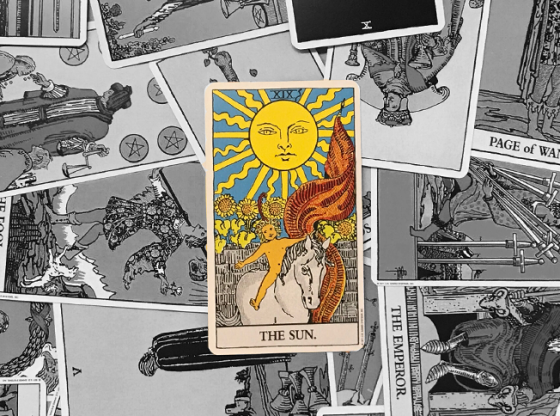 The Tarot can help us navigate life transitions with grace, armed with the insight and guidance that comes through the cards from our guides or higher self. 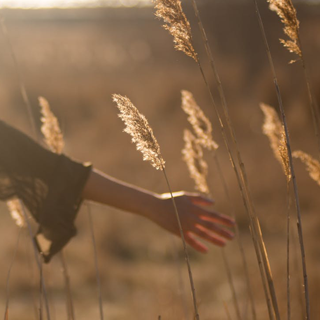 By learning this Life Change spread, you will be able to move with the energy and events occurring instead of being stuck in resistance or fear. Emily booked a reading to help her deal with a surprise career transition. She was unexpectedly laid off from her job and had no idea what to do next. She had a month to really figure it out and deeply wanted to understand why this had occurred in her life and what opportunity this might be in disguise. Card 1 is you—what energy you are currently embodying, what lesson you may be learning, or even what may be transitioning away. Card 2 is the energy of the situation—similar to Card 1, it can be what is or what is falling away. Card 3 is what needs to be let go of. Card 4 is how to let go. Card 5 is the energy that is missing. Card 6 is the resources available. Card 7 is the next steps. Let’s see how this played out for Emily. 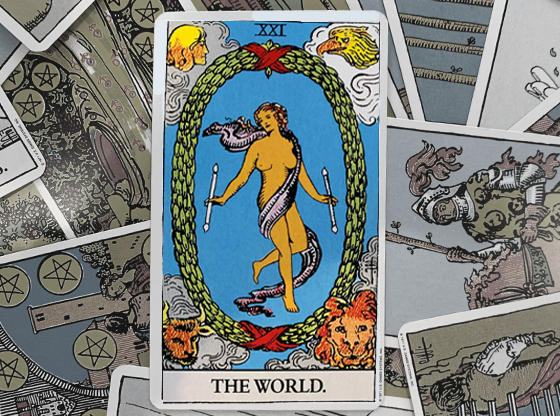 Card 1 in her spread was the Queen of Swords, and it was reversed. This told me that she did actually have the answers as to why this event had shown up in her life, but she was perhaps unwilling to look at them. Her wisdom was available but not being accessed. Also, what were the shadow qualities of this queen? Sarcasm? Superiority? Know-it-all-ness? Self-doubt or self-judgment? Card 2 was the 10 of Pentacles. 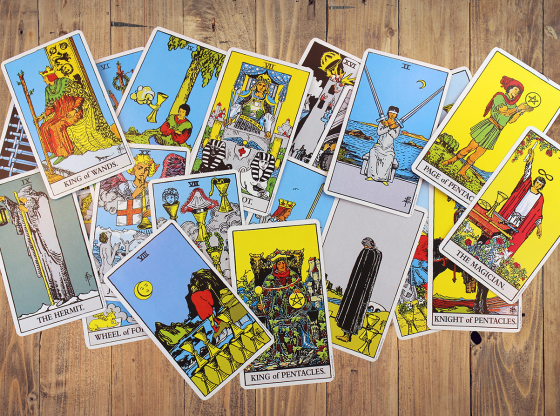 She was surprised—wasn’t her abundance about to vanish? The 10 is often the complete embodiment of the suit, but it also points to the beginning of a new cycle. 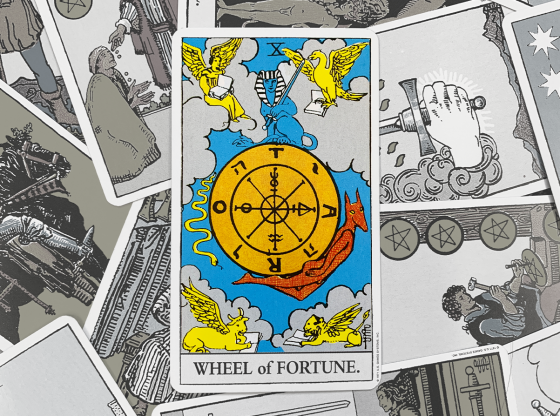 So yes, certainly her known source of financial abundance was falling away, but this card showed that it was time to start a new, possibly even more fruitful, cycle of work. She had completed the picture with her job, and it was time to move on. Card 3 was the 8 of Pentacles. Following Card 2, I could see that she needed to let go of her current craft and expertise and be courageous enough to follow a new path. Her career as a teacher had served her well, but it seemed there might be something else she wanted to do? She admitted that she wanted to be an artist but had been afraid to leave her “secure” job to pursue this dream. Card 4 was the Page of Cups. I told her it was time to open herself like a child, or a student, and embrace a new emotional, intuitive reality. She could use her intuition—possibly through the vehicle of her artwork—to understand why she had been laid off and what she might do to move forward. 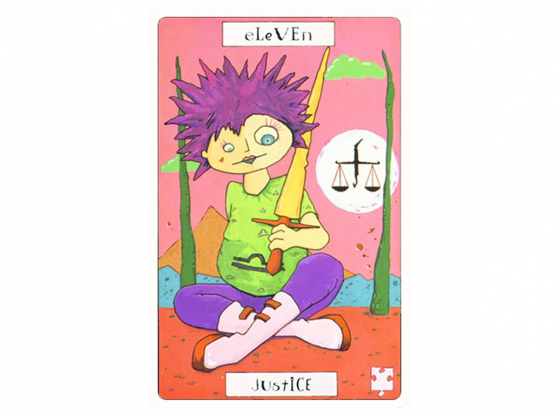 Card 5 was the Ace of Wands, reversed. Though she acknowledged a desire to be an artist, she wasn’t letting herself really feel the excitement and possibility of a new life as a painter. This card suggested she would benefit from feeling that energy as well as sharing it with others and putting it out into the world. What else might she do as an artist to bring in work and money for herself? 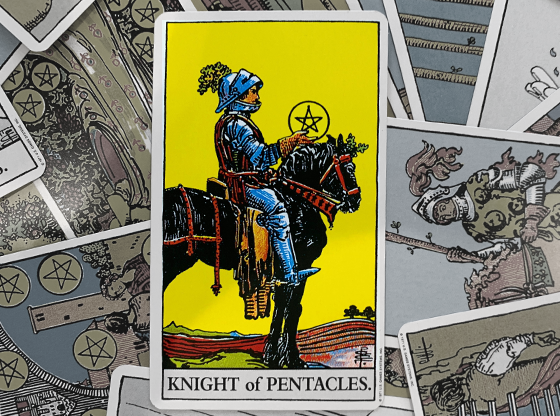 Card 6 was the King of Pentacles. I asked her if there was a settled male figure in her life to whom she could turn for help, or if she could draw upon her own inner “good father” to help herself find stability in this time of change. She said that she had been thinking about asking her older brother for a loan to help her transition but had been afraid to ask. He was so settled in his career—what if his reaction to her lay-off made her even more stressed-out? Emily also confessed that she felt she had stayed in teaching longer than she wanted, but perhaps this was her opportunity to dig deep and share her gifts with others in a different way. This King is generous with his resources and finds a way to help others prosper. She agreed to consider, with Card 5, what new ways she could share her gifts to help others thrive, too. Card 7 was the Fool. Take the leap, I told her. Follow your heart—now is the time. Have courage and trust that life is handing you a fabulous opportunity, and you will be guided and know how to take care of yourself. 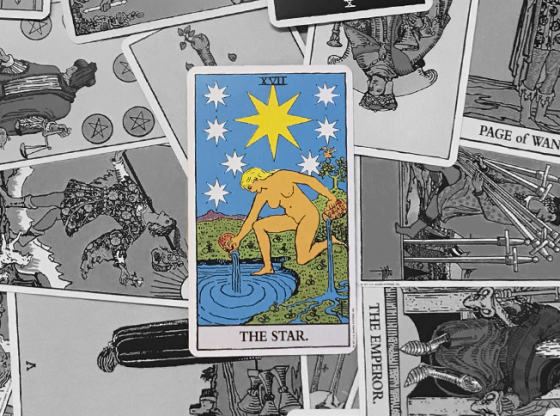 It might be scary—and she would need to keep her King of Pentacles wisdom about her—but the leap of faith would be worthwhile. 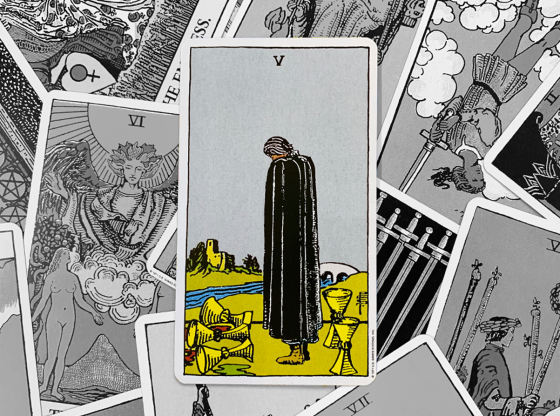 This seven card spread provides guidance and insight into how to navigate big transitions. 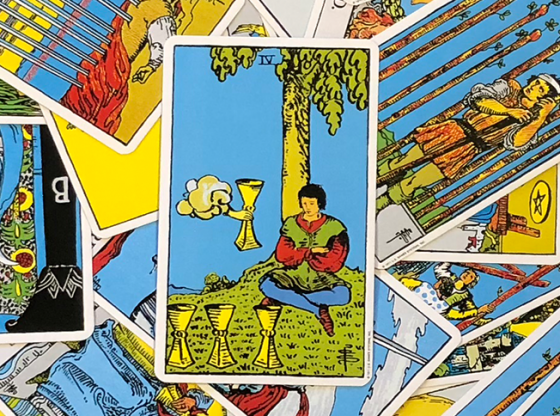 I’ve used this spread for myself and so many clients, and it provides the clarity and direction needed to bust through the fog and indecision that often accompanies major change. 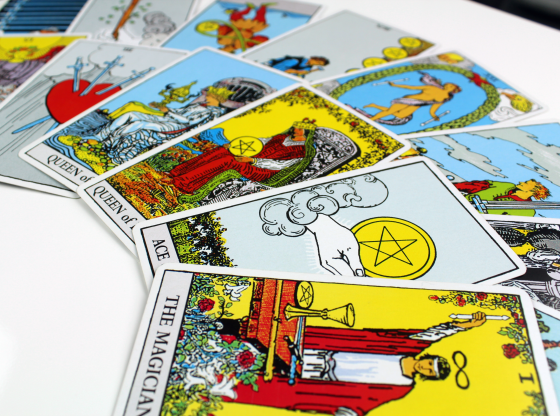 Though of course you can do any spread for yourself, working with a Tarot professional brings additional objectivity and assistance in your times of greatest need. Are you navigating deep waters? Need support and guidance through a life change? Why not get the support of an advisor on Keen today?